Lifting Gear UK is the one-stop provider for a comprehensive lifting and handling equipment. We also have a specialist division, Lifting Projects, which focuses on contract lifting services. Lifting Gear UK specialises in customised fabrications, equipment hire, LOLER inspections, onsite or offsite testing, repairs and sales. Our product range includes heavy lifting and jacking equipment with capacities of up to 700t, as well as general site and manual handling equipment. We also have various height safety equipment and solutions available for sale or hire. Lifting Projects offers contract lifting services for various industries, including offshore, onshore, renewables and oil and gas sectors in the UK. Our services are delivered through our ISO 9001:2008 accreditation and our specialist contract lifting is undertaken by our CPCS-qualified and trained workforce in accordance to the BS 7121-1 2006 standard. Our services and unique alternative lifting solutions have been used in a number of high-profile projects. These include the installation of tunnel boring machines (TBMs) on the Crossrail project in London, as well as lifting the 700t UB07 forward island and the UB14 Island onto the HMS Queen Elizabeth aircraft carrier at the Rosyth Dockyard in Scotland. Lifting Gear UK provides clients with advice, examination criteria and the necessary means to perform Lifting Operations and Lifting Equipment Regulations (LOLER) inspections. LOLER combines a number of legal requirements associated with lifting gear into a single, statutory inspection system. The aim of LOLER is to protect operators and personnel who work closely with lifting equipment. Using up-to-date technologies, including computer-aided design (CAD), Lifting Gear UK offers a complete design and fabrication package as part of a client’s customised lifting solution. With more than 120 years’ experience in executing heavy lifts across the UK, every operation performed by Lifting Projects is comprehensively engineered and planned. Each lifting project undergoes an initial rigging study to guarantee maximum safety and efficiency throughout the procedure. Lifting Projects UK has a large range of heavy lifting accessories, which are available for general hire on a national and international basis. Our rigging equipment is continuously maintained and inspected to the highest standards and key components are load-tested to ensure the utmost lifting safety. 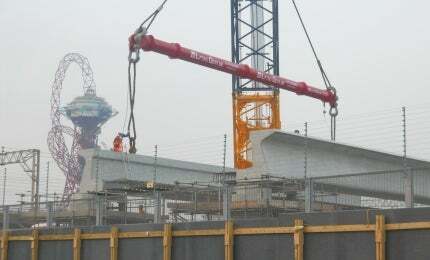 Lifting Projects offer a vast supply of modular spreader beams ranging from 9m to 20m in length. We also offer longer lengths of up to 26m, which provides a safe working load of 349t. Lifting Gear UK is a member of the Lifting Equipment Engineers Association and its staff consists of technical committee members and a team of trained technicians and engineers. Monthly winner safety award, presented to: Chris Turner.